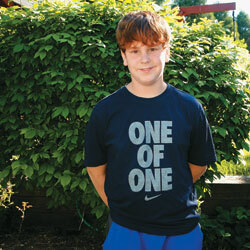 Joey has been blessed with the telling of his story in two Diabetes Publications within a few months of one another. Joey Balistrieri, 12 years old. Diagnosed with Type 1 Diabetes in 2009, at age 8. We never could have imagined that this would be Joey’s path; to be named Youth Ambassador for the American Diabetes Association, to educate other kids about type 1, and to make it his mission to help other kids realize that if they follow their dreams, and don’t take NO for an answer, they can come true. Who could have imagined that a professional football player, named Jake Byrne, would take an interest in Joey, mentor him, and now write an incredible story about how he is impressed by Joey, our Joey Balisrieri, 12 years old, diagnosed in 2009, at age 8, inspired him. All I can say is that if life throws you a curve-ball, pick it up, and throw it right back, because you never know what will happen when it lands. We will soon release the link to the article in Diabetes Health Magazine.